Unfortunately I can’t guarantee any of the claims of the properties of gemstones, but there surely must be something in it, given that every culture has its beliefs surrounding the supernatural properties of gemstones, some going back thousands of years. Gem scholars are of the opinion that the tradition of “birthstones” came from the Breastplate of Aaron which is mentioned in the Old Testament book of Exodus. This is believed to have been a ceremonial religious garment set with twelve gemstones, each representing the twelve tribes of Israel, and which also corresponded with the twelve signs of the zodiac and the twelve months of the year. Turquoise is said to be the last of the twelve gemstones set in the ceremonial breastplate of Aaron. 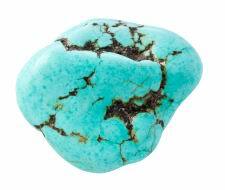 Turquoise is thought to be one of the oldest known minerals and was one of the first gems to be mined. It is said to have been mined more than 6000 years ago in Sinai. It is still considered to be a stone of prosperity and some believe that Turquoise brings the wearer good fortune and a prosperous life, inspires cheer, wellbeing and spiritual harmony. Healers believe that Turquoise attracts healing spirits, making it a premier healing stone. It is said to be a cure for many ailments and is thought to guard against all diseases. So with all its claims who could resist?! Not only does it have many traditions and folklore attached to it but it also a beautiful gemstone. And Turquoise is considered primarily to be a stone of friendship and loyalty, so yes, it makes an ideal Christmas (or birthday) present for a loved one!